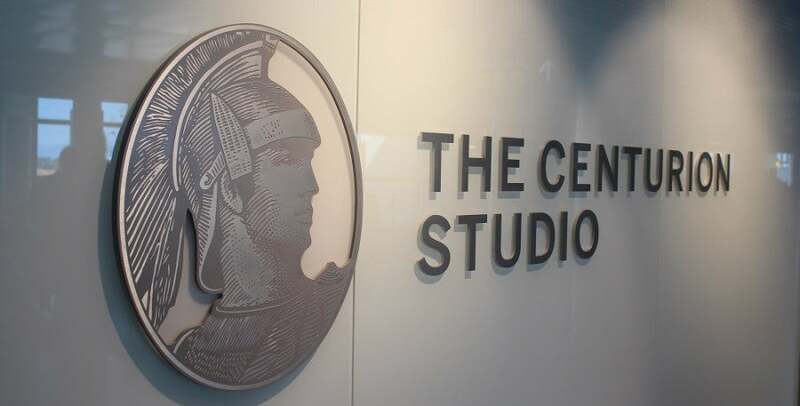 Last week, TPG Points & Miles Editor Peter Rothbart had a chance to visit the new Centurion Studio in Seattle. Here’s his take on the latest lounge offering from Amex. On my way home from Las Vegas, I stopped by the new Amex Centurion Studio Lounge at SeaTac International Airport (SEA). This is the sixth US lounge in the Centurion network, and having been thoroughly impressed by my previous experience with the Centurion Lounge, I was eager to see what Amex had in store for Seattle. 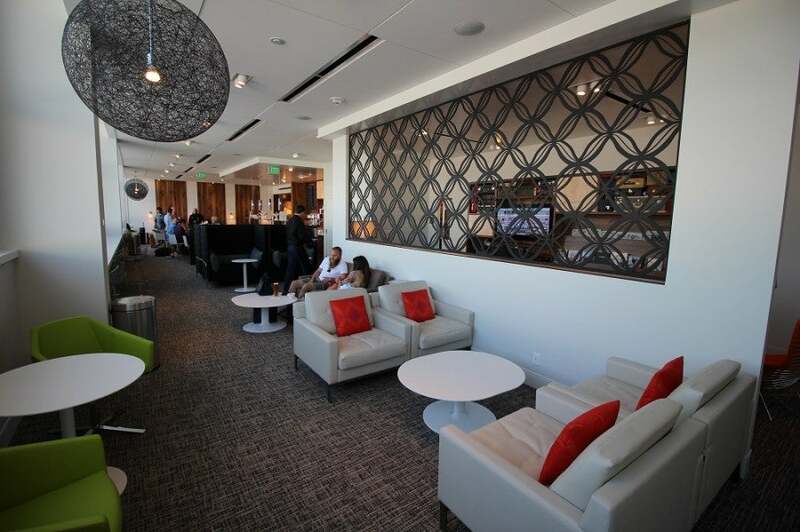 The Seattle Centurion Lounge is the first one to follow the Studio concept. 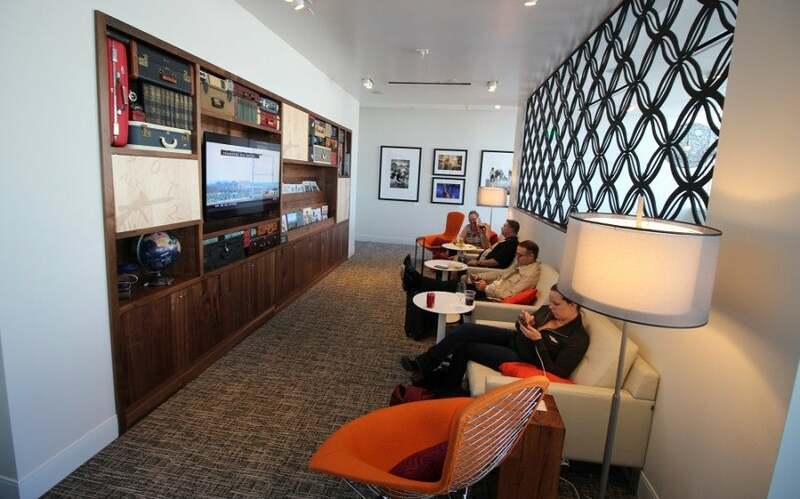 Unlike the Centurion Lounges in Las Vegas (LAS), Dallas (DFW), New York (LGA), San Francisco (SFO) and Miami (MIA), the Seattle lounge is known as a Centurion Studio, which basically means that it’s similar in style, but offers fewer amenities in a (much) smaller space. 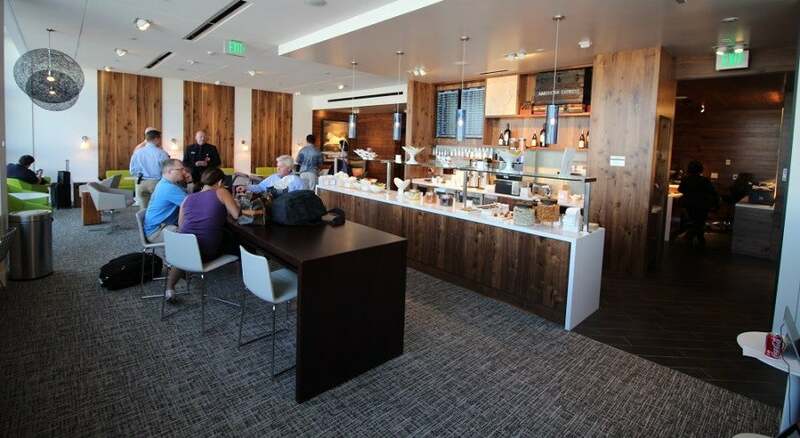 Also unlike the other Centurion lounges, access is only granted to those who have the Centurion Card or The Platinum Card® from American Express (including other versions such as The Business Platinum® Card from American Express), along with immediate family or up to one guest. Normally, members can bring up to two guests, and other Amex cardholders can purchase one-day passes for $50, but those options are unavailable at the Seattle lounge due to the limited capacity. The Seattle lounge is located after security in Terminal B, in the old Delta Sky Club just across from gate B3 (next to Sbarro). The entrance is clearly marked both on the outer walls and by an overhead sign. It’s a pretty convenient spot, since it’s just a minute or two beyond security and close to the airport’s central hub. Terminals A, B, C and D are connected, so you can access the lounge on foot. You’ll have to take a short tram ride to get there from Terminals S and N. It’s open from 5am to 10pm daily, which should accommodate the majority of departures and arrivals. You can’t miss the lounge when you’re walking through Terminal B. Once inside, I was greeted by the front desk staff situated across from the iconic “living wall” that you’ll find in the other Centurion Lounges. The foyer is all tile and wood paneling, and a long wall sits opposite the door to obscure the main portion of the lounge from the terminal outside. The foyer, including the front desk and living wall. After checking in, I made my way into the main portion of the lounge, which is essentially one long, carpeted room that has been tactfully arranged so that it feels like several distinct spaces. At one end is a wide open seating area with several clusters of lounge chairs, small sofas and cabaret tables, as well as the lounge’s two private bathrooms. The main seating area, with bathrooms along the wall and the main door visible to the left of the service area. In the middle you’ll find the food and beverage service alongside a larger meeting table with seating for 6 (or maybe 8 in a pinch). Apart from the front desk staff, there are typically several servers on duty who are more than happy to bring you beverages and clear away used items promptly. The food and beverage service area, with the meeting table in the foreground and the front desk visible on the right. So … who has the remote? The other side features fairly private seating for another 8-10 people, with plenty of light coming in from the windows on the runway side of the lounge. This is about as private as it gets in the Seattle Centurion Studio. Speaking of all that light, one whole wall of the lounge looks out onto the tarmac, where you’ll see the A and S gates, a few hangars, and an awesome view of Mount Rainier towering majestically over it all. When the weather obliges, the lounge can offer pretty scenic views. Overall, the lounge is stylish and comfortable, but while the designers did a good job providing a variety of seating options with some degree of privacy, the space is even smaller than I expected. There were only a dozen or so people inside during my visit, so I had no trouble stretching out, but there wouldn’t be much elbow room if it filled to the seated capacity of about 60. While this inaugural Centurion Studio has the basics covered, the amenities (or more specifically the lack thereof) set it firmly apart from the other Centurion Lounges. As discussed above, you’ll find comfortable and relatively private seating. There are plenty of outlets to charge electronics, as well as high speed Wi-Fi (though SeaTac already has decent public Wi-Fi, and you can usually find a charging station unless the airport is exceptionally busy). There’s also an electronic departures board so you can monitor your flight status from within the lounge. The food options are pretty limited: cut vegetables and dip, fruit and nuts, breadsticks and hummus, chips, cookies and chocolates. 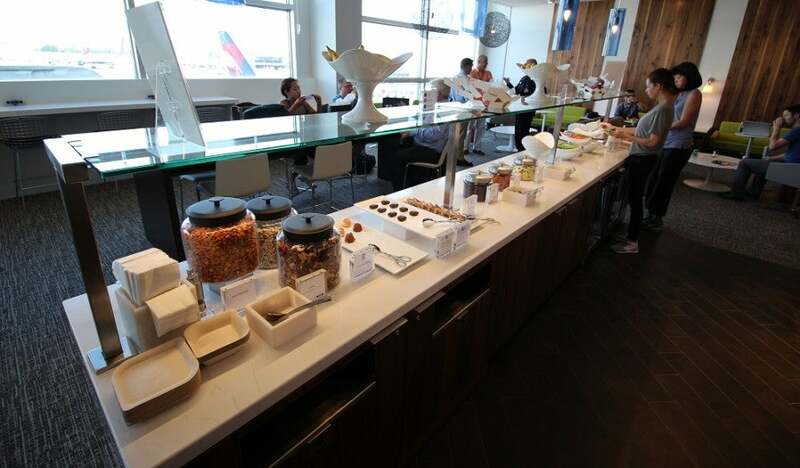 It’s all snack food, which is pretty disappointing considering how good the menus are in the other lounges. The small kitchen has no stove or oven, and while the staff I spoke to said it was plausible that hot food could be served in the future, there are no plans to add any at the moment. If you show up hungry, you might be disappointed. The beverage options are a bit more inspiring, with filtered water, coffee, tea (hot and iced), soft drinks (including local favorite Jones Soda) and a short list of local beers and wines. There’s also an automatic espresso machine, so you can choose the form of your caffeination. Unlike the other lounges, there’s no liquor (and thus no mixed drinks). The wall of beverage options, along with the departures board at the top left. While I didn’t expect any over-the-top perks like the Exhale spa in Dallas, there’s not much more for the Seattle lounge to hang its hat on. There’s no private conference room, no shower suite, no public computers, no print or copy services, no family room and no good place to take a nap. The space simply isn’t large enough to accommodate any other amenities without reducing the already low seating capacity. The new Seattle Centurion Studio does a lot of things right: It’s comfortable and quiet, and it offers some basic services in a convenient location. 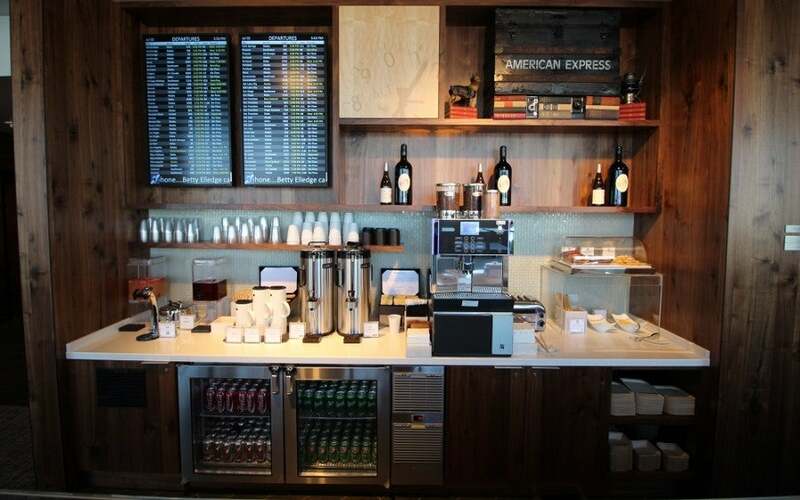 However, it’s a bit of a letdown from what Amex cardholders have come to expect from the other Centurion Lounges, especially with respect to the food and beverage offerings. I think the service would be vastly improved by adding just a few prepared items and a small bar. The staff I spoke with weren’t shy about telling me that Seattle’s lounge is the first Centurion Studio, implying that there will be more to come. 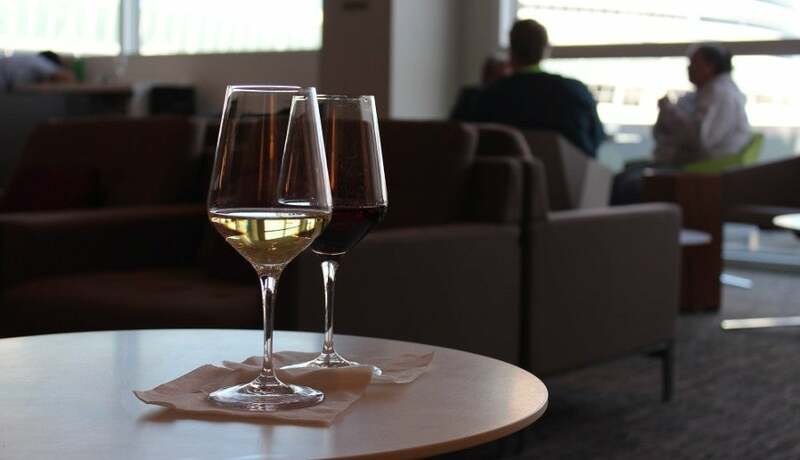 Considering that there has been no formal announcement about future lounges, and that it took about 8 months from when Amex announced the Seattle lounge to when it opened, I’d wager that we’re not likely to see any more new lounges in 2015. Chicago, Los Angeles, Atlanta and Denver all seem to be likely targets, but for now we’ll just have to wait and see. In the meantime, I’d love to hear impressions from those of you who have visited the Seattle Centurion Studio. Did it meet your expectations, or do you think Amex should already be looking for ways to make improvements? Please share your thoughts in the comments below! Apart from your home airport, where would you most like to see Amex open the next Centurion Studio or Centurion Lounge?